Provide the connection with a name and enter a description if required. Enter the URL of your M-Files REST service here. 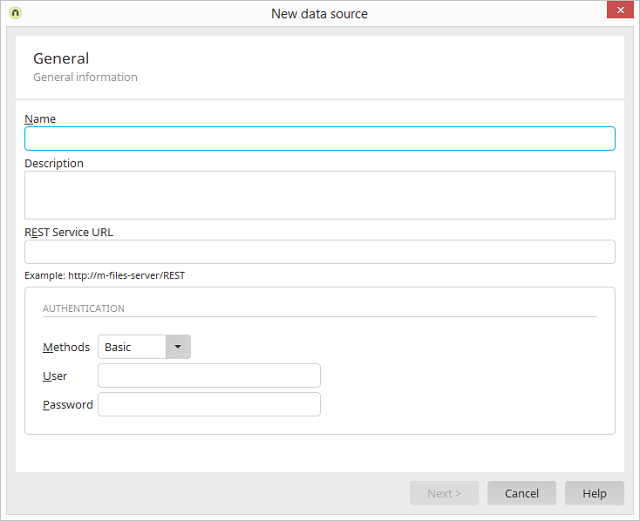 You can find the M-Files REST service URL in your M-Files server installation. Usually, this consists of the host name of the M-Files server, the name of the virtual directory of the M-Files Web Access application, then followed by the path/REST for the REST service. Access to the M-Files REST service can also take place via SSL. In this case, the M-Files URL must start with "https://". Beforehand, the SSL certificate must have been imported to the Intrexx certificate store. With the Basic method, the user, whose login details are entered here, will be used for the authentication. 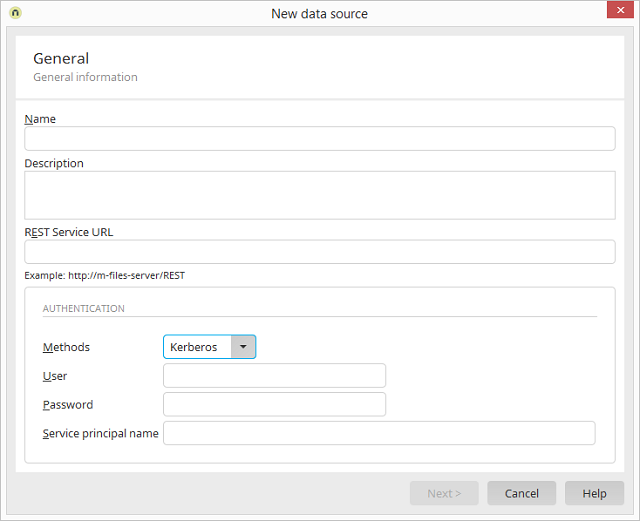 The Kerberos method can be used for Windows Integrated Authentication (single sign-on). An M-Files user and their password must be specified for both authentication methods. This user is required to read the metadata structure of the M-Files vault and therefore requires the corresponding permissions in M-Files. The Intrexx Portal Server must be run through the Microsoft Internet Information Server and be a member of a Windows domain. The Intrexx Portal Server must be configured for Windows Integrated Authentication and the users must be imported from the Active Directory. A Service Principal Name must be defined for the M-Files Web Access Internet Information Server. Single Sign On authentication must be active for the M-Files Web Access server. You can find more information on this topic in the M-Files documentation. For each Intrexx user who will access M-Files, a corresponding Windows Account User must exist in M-Files. The portal client workstations must be members of the same Windows domain as the Intrexx portal server and the M-Files Web Access server. Windows Integrated Authentication must be activated for the client browsers. Replace "<M-Files DNS Name>" with the fully qualified DNS host name of the M-Files Web Access server. The host name must be the same as the host name that was entered for the M-Files REST Service URL. Integrated authentication is activated automatically after saving the configuration. If the configuration is successful, Intrexx portal users are automatically authenticated for M-Files when accessing M-Files files.